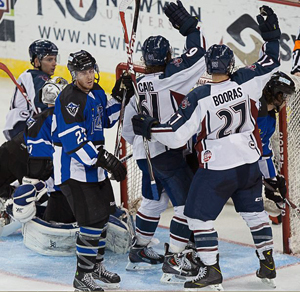 TJ Caig led the way with a hat trick (three goals) and Tommy Mele, Adam Pleskach, Jon Booras and Scott Macauley added single goals to help the Tulsa Oilers top the Wichita Thunder 7-4 in the InTrust Bank Arena on Saturday night. The win was a critical one for the Oilers, who have been a bubble team in the ECHL Central Division playoff race since the beginning of 2015. 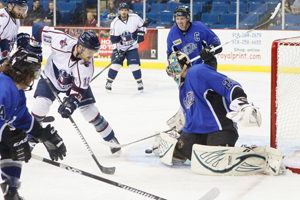 After the Thunder assumed an early 1-0 lead at 2:26 of the first period with a Justin Bernhardt power-play goal, Caig began his run toward the hat when on the power play, Jon Booras funneled a pass out of the corner to set up a one-timer for Caig who blasted the puck over the shoulder of Tim Boron to level the score at 1-1 at the 5:27 mark. Tommy Mele extended the visitors lead to 2-1 when he tipped a Nathan Lutz shot past Boron to give the Oilers their first lead of the evening at the first period’s six and a half minute mark and the Oilers would rid the one goal advantage into the game’s first intermission. The Thunder seized the momentum in the early stages of the second stanza thanks to quick strikes from Todd Hosmer and Nikita Kashirsky. Wichita was back out front 3-2 but the lead lasted only three minutes as the Oilers picked up the equalizer from Adam Pleskach. After Boron made a save on a sharp-angle offering from Dave Pszenyczny, the puck bounced off Pleskach and into the net at 6:46. Caig netted an even strength goal in the second period a little under two minutes after Pleskach’s goal when he jammed home an Eric Tallent rebound to give the lead back to Tulsa, then Scott Macauley slipped a backhand under Boron to give the Oilers their third unanswered goal in the second period. In addition the Oilers outshot the Thunder 16-11. The Oilers held the two goal advantage for most of the third period when the Thunder pull the game close with a Mike Wilson goal with a little under four minutes to play. Wichita head coach Kevin McClelland then pulled Tim Boron in favor of a sixth attacker, but it did not pay off. Booras found the empty net with a backhand lob from inside his own zone at 18:37 and Caig put the finishing touches on the win by firing into the open cage with 11.9 seconds remaining. Caig was one of three Oilers to finish the night with three points. Booras ended the tilt with a goal and two helpers while Drew Fisher recorded his sixth three-point night of the season by dishing out three assists. Over their three-game win streak, the Oilers have outscored their opponents 17-6 and Kevin Carr, who made 30 saves on Saturday, has been in net for all three wins. Tulsa has scored a power play goal in six of its last seven games but has also surrendered a power play goal in nine of its last ten. The road trip continues on Sunday afternoon in Allen when they take on the first-place Americans. This entry was posted in Sports on February 22, 2015 by admin.